Nose: Spiced rum is big on the nose along with some earthy spices, nutmeg, toffee, and brown sugar. Palate: Quite sweet with dark golden syrup, burnt toffee, lots of oak spices, toasted oats with brown sugar. A bit grassy and peppery. Mouthfeel: A fair bit of alcohol heat in this whisky, particularly at the tip, and the back of the tongue – but not a particularly harsh heat; more sparkle than burn. Reasonably creamy without being thick or chewey. The burn doesn’t last particularly long, although the mouth remains warm right through drinking and into the finish. Dry, and not at all oily. Finish: Medium length, both sweet and spicy at the same time; toffee, brown sugar, cinnamon. Still a fair bit of heat – more than you’d expect from the 46% ABV that this whisky is bottled at. On the rocks: Adding some ice thickens the mouthfeel, and not-unexpectedly reduces the alcohol burn. The palate sweetens somewhat – adding a touch of honey; increasing the cinnamon whilst removing a fair bit of the oak spices, and adding a hint of vanilla, and some fresh cut grass and hay. The Small Batch was the first of the “new Teeling” whiskies to be released, and rather unusually has been finished in rum casks. The whiskey is a blend of both grain and malt whiskies, and has been aged for between 4-7 years (including the time it was finished in rum casks), and is not chill filtered. The Teeling family has been involved in distilling whiskey since 1782, although the latest generation, Jack Teeling (later joined by his brother Stephen), launched their current company in 2011. Stephen was formerly a manager at the Cooley distillery which was founded in 1987 by Stephen’s and Jack’s father, John, and sold to Beam in 2011 – where Stephen was global marketing manager for Irish whiskey until he left to join his brother Jack at Teeling in 2013. The new Teeling distillery in The Liberties in Dublin is located almost exactly where the original Teeling distillery, which was founded by Walter Teeling in 1782, was located; and is the first distillery to open in Dublin in over 125 years. Teeling whiskey is also the first whiskey to be commercially distilled in Dublin since 1976 – when Jameson merged with Powers and Cork Distillers to form Irish Distillers, and moved all production to the New Middleton Distillery in Cork. The whiskey in this bottle of the Small Batch was distilled at the Cooley distillery (whiskey from the Teeling distillery in Dublin didn’t start to flow until 2015). I can only assume that in a few years whiskey that has been distilled at the Teeling distillery will be added to the mix. This is an interesting whiskey, unmistakeably Irish in many ways; yet completely different to any other Irish whiskey that I have yet consumed. I don’t know whether it is the Rum finishing, or if it was distilled or aged in some particular way – Teeling is not exactly forthcoming with many aspects of the whiskey itself (which is in many was understandable as it is not yet distilled at their distillery, and I’m sure they want their brand to be independent and not just seen as a spin-off from the Cooley distillery). Although very young, and a bit rough around the edges; this is quite an easy drinking whiskey – especially when served on the rocks, and indeed several bottles of it have made their way through my whiskey cupboard. It’s also extremely good value (at least in Australia), being one of the cheapest whiskies that you can buy (although it has gone up by about $10 since its launch). At it’s current price point here, it is by far the best whiskey that I have tasted in its price bracket. 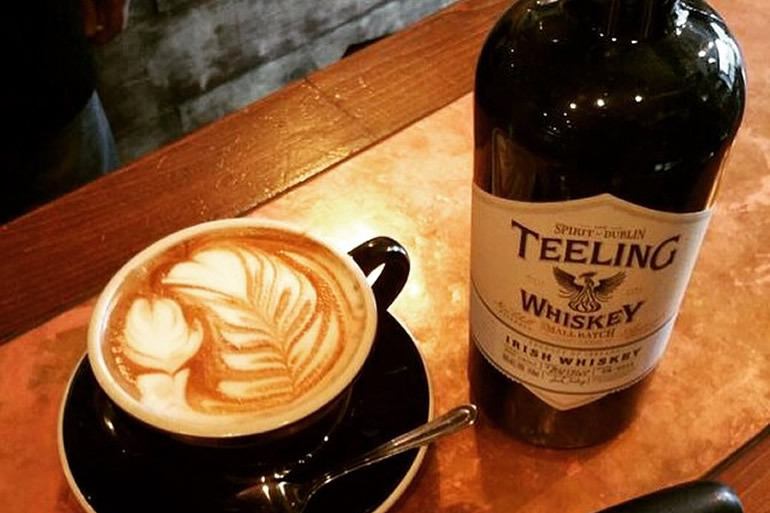 The Teeling Small Batch Irish whiskey also makes an absolutely cracking Irish coffee. I used to think that that was the entire purpose of Jameson whiskey, and if it is, it now has no purpose – as the extra punch and the extra sweetness of Teeling’s Small Batch blows it out of the park!